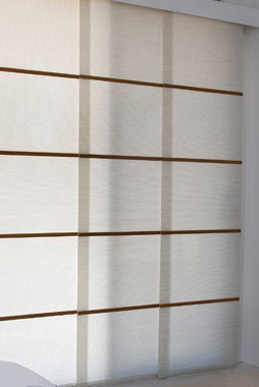 Panel glides provide a stylish alternative to traditional vertical blinds and curtains. Adaptable and versatile, panel glides are a perfect solution for sliding doors and large glass areas. 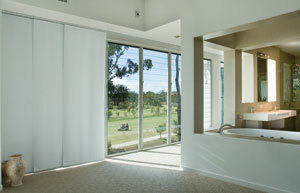 Sliding smoothly across the window or door, the simplicity of the panel glide blinds ensures easy use. Panel glides make a bold fashion statement and creates a more relaxed, informal look. Available in a vast range of fabrics and colours. Homeowners who love stylish and elegant additions to their homes should most definitely try out Panel Glide Blinds. 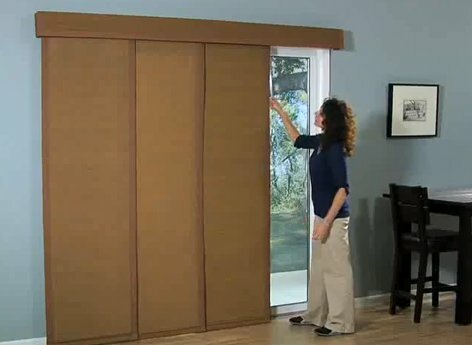 They are specifically designed for open-plan homes with sliding, wide doors. The blinds are also perfect room dividers. The variety in sizes, colours, fabrics and stacks available adds value to their wow-factor. There are 4 types of fabrics, namely: plain, sunscreen, textured and block-out. The aluminium and timber used for decorating the blinds match the blinds’ colours. Finding a blind that can be easily matched with other types of blinds is usually a taxing affair. However, Panel Glide blinds are handcrafted to match beautifully with Roller and Roman blinds. To prevent rusting and corrosion on the battens and glides, a powder coating is used for the perfect finish. The blinds are therefore one of the best in the market. Durability and class deeply describe these outstanding products. By dividing the track width by the panels used, the panel size is derived. The stacking alternatives available for the glides are several. There are three major ways of drawing panel glides: 1. In one direction – when there is a maximum of 5 panels 2. From the centre – when there is a maximum of 9 panels 3. Off the centre opening. Lukewarm water together with soap easily removes stains: Just dip a clean sponge in the water with soap, squeeze it almost dry, and wipe off the stains. Sometimes resort to sticky tape to lift dirt marks. Ultrasonic cleaning solves any tough and stubborn stain problems. Since the blinds in question are handcrafted by highly skilled and experienced professionals, they satisfy all clients’ needs. They can be customized to meet every unique customer requirement. They solve the problems encountered by homeowners with large windows and doors that only limited blinds can fit. Feel what it means to be modern and sophisticated with these blinds. No regrets whatsoever. There is absolutely no reason to be limited to vertical blinds anymore. Panel Glide blinds are the perfect and stylish alternative today. The most important characteristic of the blinds is that they are light and simple to use. This is because; the rail and tracks used are not complicated at all. Anyone can operate the blinds. The fabrics used on the panels are crafted in a way that makes them flat and very light. The fabric is also easy to clean. Stains do not stick too much on them. That is why common lukewarm water and soap removes most stubborn stains. A good product deserves a reliable and superb company to design, manufacture and supply it. 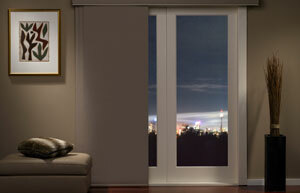 It is of utmost importance to be able to make a wise decision on where to purchase blinds. But the great sea of suppliers and installers makes the task almost impossible. To be on the safe side, simply contact Complete Blinds for the best and superior products in the market. Call us on 02 8824 7975. Complete Blinds, for all kinds of blinds.